What are the different types of users? Why do I need to fill out the Instructor Profile? Our whole purpose behind this platform is for you to present more and manage less. As the CEU administrator and/or manager, you have enough to do when it comes to managing CEUs. We want to help you as much as we can to make your next CEU event more successful. 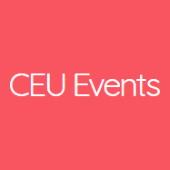 Add all of your CEU or Training Courses to your account You and your Instructors will be able to schedule events for all added CEU courses or PK Trainings. When you assign territories to your Instructors your courses will be available on Request CEU Event locator allowing trade professionals to schedule their next face-to-face CEU directly with your Instructor in the area. Your CEU Program will appear on your Company Profile page that will have a function for anyone to schedule their next CEU event directly with your Instructor. We recommend you create CEU Events™ link or a button on your company website pointing to your unique URL. You will be able to promote your CEU Program with call-to-action. The success of your CEU events is very important to us. Please let us know your feedback and/or suggestions after using our services. Thank you for your support and enjoy presenting!